This project forms part of the wider restoration of Cardenal Tavera’s sepulchre and was conceived as a collaboration between Factum Foundation and the Ducado de Medinaceli Foundation. The white marble sepulchre was the final commission of the sculptor Alonso Berruguete – it was made in 1552 for the Hospital of San Juan Batista (better known as the Hospital Tavera) in Toledo, Spain. The objective of the first phase project was to record the sepulchre using different methods, including photogrammetry and structural white light 3D scanning. The marble is an especially complex material for photogrammetric recording as it is glossy and featureless. The resulting data will serve as a reference for the future restoration of the sepulchre, giving a precise description of it's current state. The second phase will involve the digital reconstruction parts of the ‘Virtues’. By recording the sepulchre and then using 3D modelling software, we will be able to accurately reintegrate missing areas and fix cracks to create a ‘restored’ digital model. The sepulchral chamber was recorded using the long-range laser system FARO s150. The scanner registers accurately measured points – this data will be used together with photogrammetry to produce an accurately scaled model of the sepulchre. The LiDAR recording was made from seven positions. The surface data produced with this system was not sufficiently detailed for our purposes, but the metrical accuracy of LiDAR reamins helpful when scaling photogrammetry data. Over four days, a team from Factum Foundation captured over 2500 images of the sepulchre from different angles. The images were processed and prepared to generate a 3D model. The process of obtaining 3D data from image pairs is known as photogrammetry. The greatest difficulty of this particular recording resulted from the material qualities of the marble, as well as from the size of the sepulchre. The white, glossy marble surface challenged photogrammetry's usual efficiency. When the processing software locates common points between images, a completely white surface can appear featureless to the software. Two cameras were used for the recording: a 42 Mpx Sony ILCE-7RM2 and a 58 Mpx Canon 5DSR with 50 mm sigma lenses. The simplicity of the recording equipment makes photogrammetry an accessible 3D recording method providing both surface and colour information for an object. With this process, a valuable photographic record of current state the sculpture could be obtained. Once the images are processed, it will also be possible to generate a high-resolution 3D model for inspection, study or reproduction. The Smartscan H5 white light scanner is a structured light triangulation scanner designed specifically for recording cultural heritage. The scanner works by projecting a series of patterns in white light onto the surface of an object and then recording and interpreting the deformation to those patterns created by the three-dimensionality of the object. 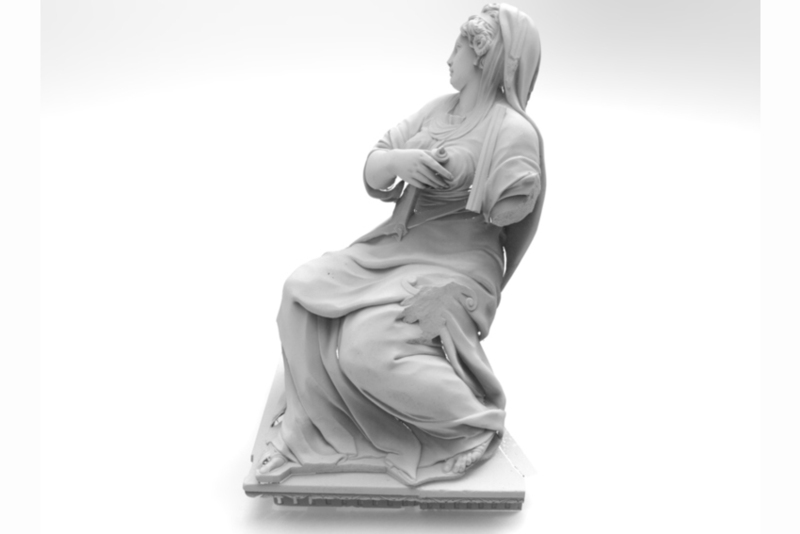 The Smartscan H5is particularly useful when recording white marble sculptures. The four Virtues on the corners of the sepulchre were recorded with this scanner, producing very accurate data to complement the photogrammetry recording. The LiDAR data was processed using Scene 7.0, a proprietary software from FARO 3D scan. The software allows the user to convert the point cloud (the raw data produced by the FARO) into a format that can be read by the photogrammetry software used at Factum Foundation: Reality Capture. The images for photogrammetry together with the laser dataset were processed in Reality Capture. This photogrammetry software allows the user to align data gathered with a laser scanner with 1000s of images in order to generate one, high-resolution scaled model of an object. This powerful software extracts measured points by identifying the position of cameras and comparing each image to others that overlap with it. A great amount of overlap is needed within the images to help extract millions of points. At the end of the process a high dense triangulated mesh is generated. The final model has over 400 million polygons and must be decimated and sliced into small parts for outputting. 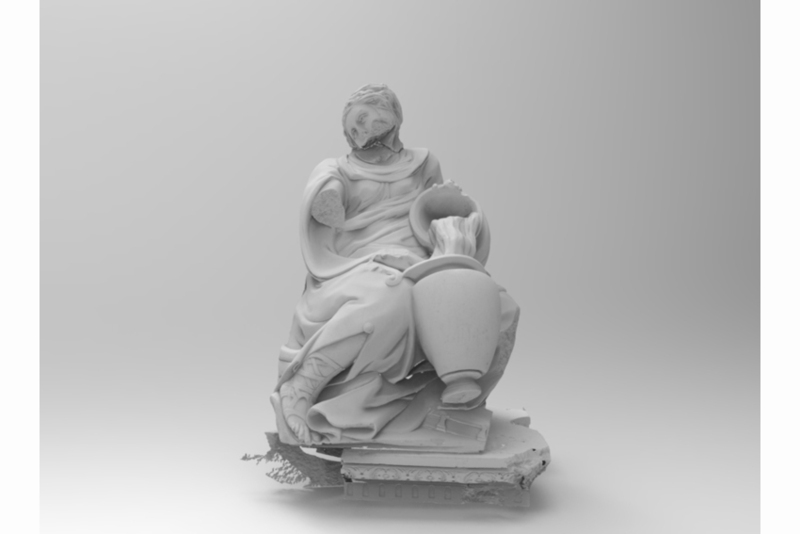 We have created a virtual model of the sepulchre for online inspection but also a high-resolution file that can be 3D printed for future reconstruction and restoration jobs. The next phase of this project will consist in digitally rebuilding a number of sections from the sepulchre that were destroyed during the Civil War. The casts have been stored in a Madrid warehouse for many years and currently represent what is probably the most accurate reference of the original state of the tomb. Factum Foundation's intention is to record the casts using photogrammetry and white light scanning which will establish an archive for the preservation of the casts. The data can also be used for the digital restoration of the sepulchre. Processing scanned data of the casts to generate a 3D model that can be laid over the recording of the sepulchre. Digitally isolate missing sections by subtracting the model of the sepulchre from the model produced from the casts. The isolated sections will be used to fill missing areas. The accuracy of the recording will ensure that both models – the sepulchre and the casts – will fit as well as possible. The final stage of the process will result in a 3D model ‘blending’ the two datasets. The reconstruction will be carried out entirely with digital modelling and retouching. The final result will a series of sections that if prototyped for 3D output would fit onto the sepulchre. The concept behind the work is to be able not simply to preserve the object, but also to use the latest digital technology to reconstruct a damaged object of great cultural value.